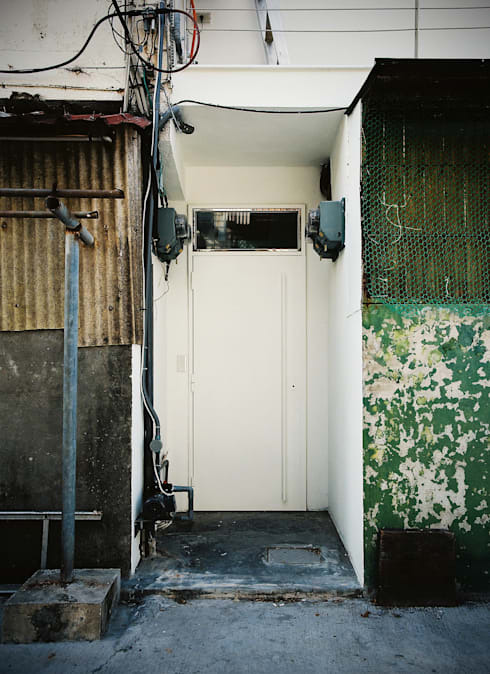 Today we’re heading to Keelung City in Taiwan to check out a wonderfully deceiving apartment. Set behind an unassuming entrance lays an eye-catching residence that’s nestled comfortably into the side of the hill. Replete with wonderfully open spaces, panoramic views and gorgeous textures, this is a truly swoon-worthy abode. 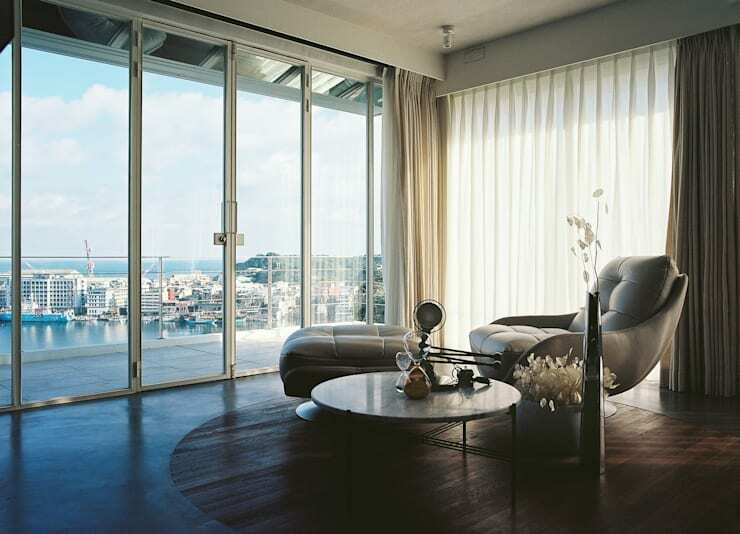 Set up to reflect the urban nature of this portside city, the sophisticated dwelling is inspired by the spacious Keelung Harbor. Originally a two-storey ‘fixer-upper’ the team at Jeng Shihchieh Design have given this old home a new lease on life. 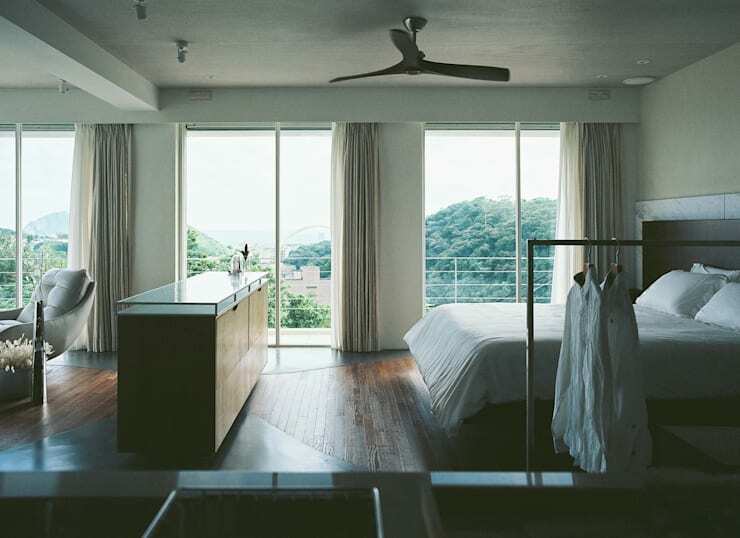 Stylish, simple and dainty, the property is the ideal getaway from Taipei City, and boasts a range of wonderfully relaxing accessories. Our first view of this dwelling is from the kitchen looking into the bedroom. Modern and urbane, the ambience is one of peacefulness and serenity. 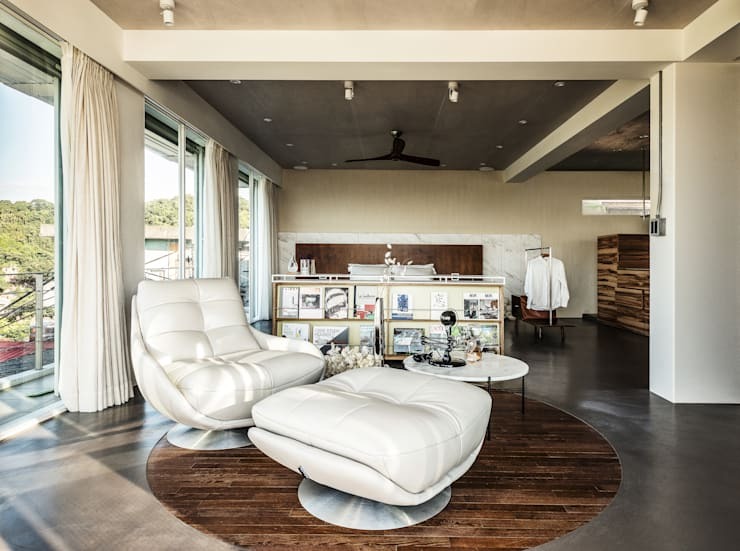 A combination of flooring has been used in the home, which is unusually curved, yet provides an eye-catching feature for the home, as well as an eclectic aesthetic. Subtle and inviting, we see that the designers have incorporated an overhead fan within the room, which keeps the space fresh and cool, while the central divider sits at the end of the bed and imparts a sense of separation from the rest of the apartment. Taking a quick look at the entrance to this home, we’re surprised by how modest the actual entry is! Humble and unassuming, this door is painted white, yet bears no resemblance to the sleek abode that lies in waiting upstairs. One of the finest rooms within this abode, the bathroom is elegant and eye-catching, with plenty of swoon-worthy accessories to keep things interesting and opulent. 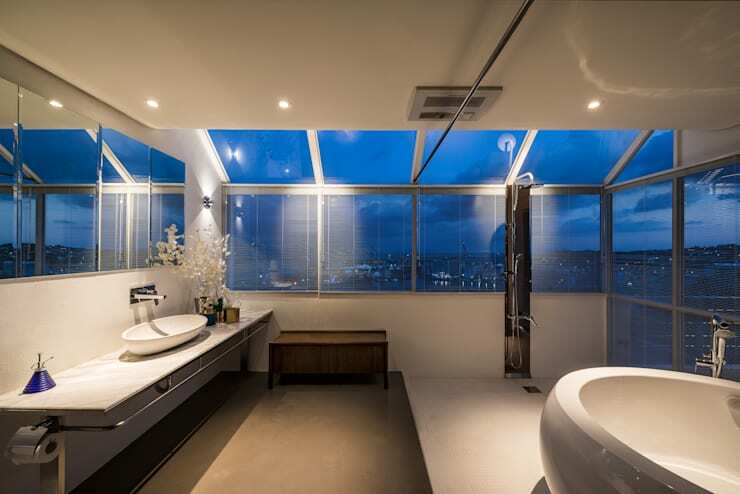 It’s also worth noting that within this bathroom space the designers have opted for plenty of glazed wall sections. 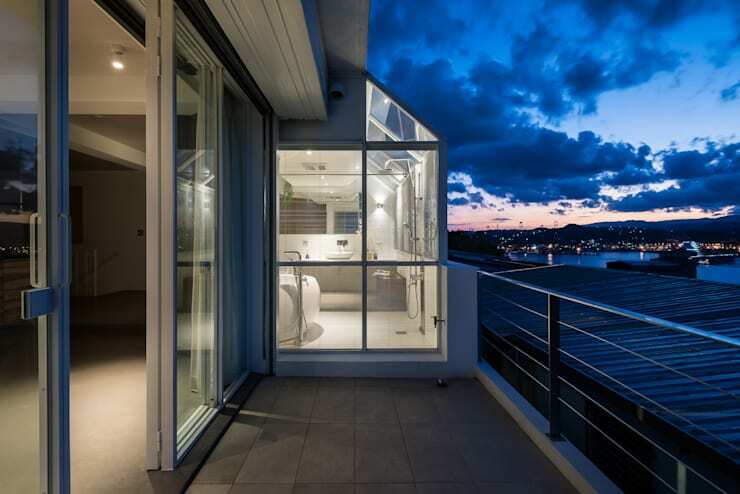 These ensure that the occupant feels at one with the natural environment, as it removes the constraints that are often felt with walls in a compact bathroom. 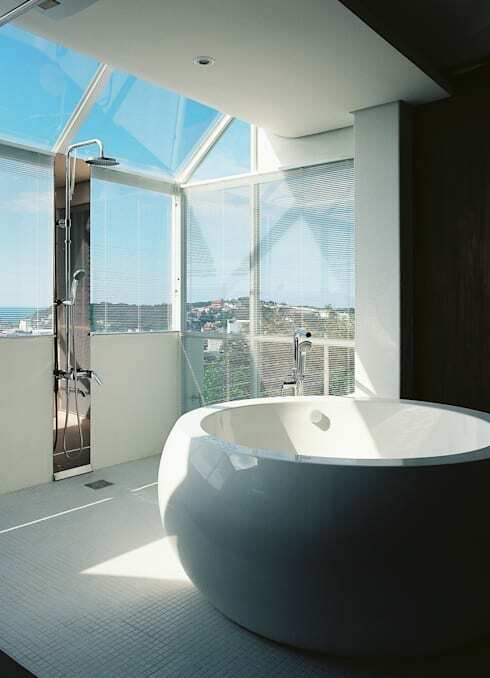 Additionally, the shower is open and placed against the windows. This is a smart move, allowing the space to benefit from a huge volume of natural light, while boosting the sense of luxury and extravagance. Can you think of a more perfect corner reading room and relaxation space? We certainly cannot! This elegant area shows the interesting flooring in more detail and is replete with only one single recliner. Definitely designed for a single person, this home would also suit a couple, but is decorated sparsely to accommodate a minimalist vibe and aura. 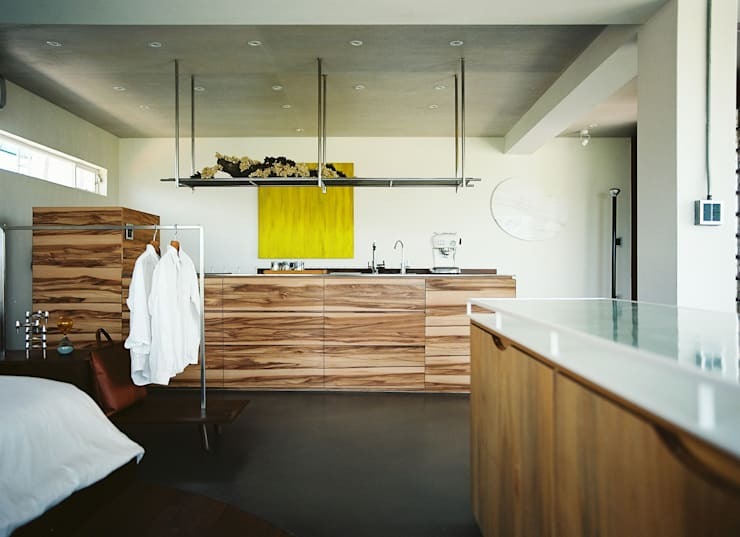 The kitchen is eye-catching and clad in a unique timber that ensures it is a standout feature within this home. Mirroring the adjacent room divider the kitchen essentially ‘floats’ within the space, and boasts overhead storage for commonly used items. Heading back into the bathroom we get a better idea of the bathroom setup, including the flooring and vanity. Sophisticated in its simplicity, the wash space is large and roomy, ideal for relaxing, resting and unwinding the body or soul. Before we end this tour we take one last peek in the living space. Here we’re given a better glimpse of the scenery, with panoramic views that can e enjoyed from the wraparound windows and overstuffed recliner.